As only one unit has been allocated for India for 2019, this is also likely to be the only Ninja H2R to roam the streets here for quite a while. 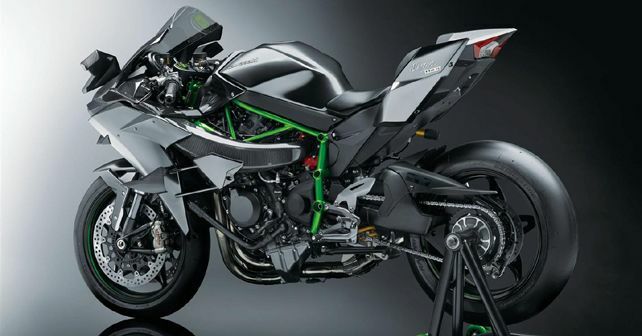 India Kawasaki Motor Pvt Ltd (IKMPL) celebrated an important milestone today as it has successfully delivered the first and only unit of its hypersport bike, the Ninja H2R, in the country. However, the Japanese marque has not disclosed the identity of the buyer. The 2019 Ninja H2R currently sits atop the global bike list for being the most powerful production motorcycle in the world, producing 306bhp and 165Nm of torque. This manic performance has been achieved thanks to some tuning trickery done in its 998cc liquid-cooled, in-line four-cylinder supercharged motor. To manage all this power and performance and, more importantly, to make the motorcycle usable in an urban environment, the H2R gets a host of safety and riding tech like the Kawasaki Cornering Management Function (KCMF), Kawasaki Launch Control Mode (KLCM), Kawasaki Traction Control (KTRC), Kawasaki Intelligent anti-lock Brake System (KIBS), Kawasaki Engine Brake Control and a Kawasaki Quick Shifter (KQS). For 2019, further updates have been introduced to the model, which include a new TFT instrument cluster, Brembo's new Stylema monobloc brake callipers, Bridgestone RS11 tyres and Kawasaki's special 'self-healing' paint technology, which can repair minor scratches on its own. The 2019 Ninja H2R also gets full-LED lighting. Indeed, this dream machine also demands a dream-like and a near-unfathomable price tag, which currently displays the figure of ₹ 72 lakh (Ex-showroom, India).